My name is Bill, and I have worked for 180 Medical for over 10 years. 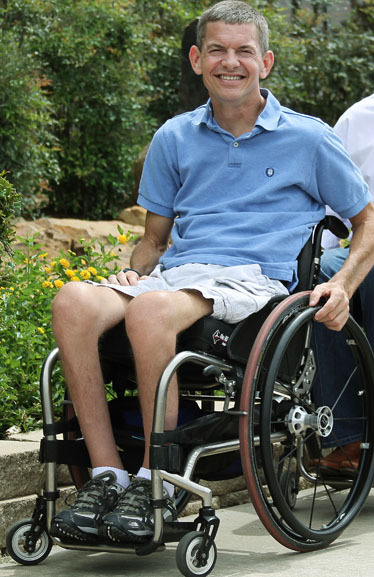 About 26 years ago, I was involved in a motocross accident that rendered me a quadriplegic. You can learn more about my story here. Over the years since then, I’ve been able to help and counsel others who are also dealing with life after a spinal cord injury. I am happiest when I am helping others, and these days at 180 Medical, I spend a lot of time just talking to our customers on the phone who are new to catheterizing. to turn yourself over if you are face down in the water while wearing a personal flotation device (life-jacket). 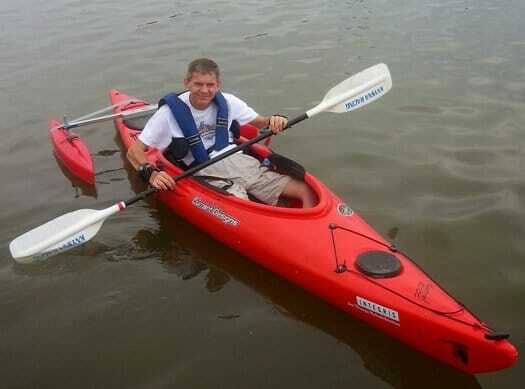 The kayaks are designed to accommodate a wide range of disabilities. For someone like myself who is a C-5,6 quadriplegic, the kayak is equipped with a special seat that has a higher back with lateral supports to keep me from falling over since I have very little trunk control. I also sit on a cushion to prevent skin breakdown from prolonged pressure. The kayak has outriggers attached to both sides which make it virtually impossible to turn over. They also have special paddles with wrist cuffs and other adaptations that allow me to grip the paddle since my hands are nonfunctioning. They provide life-jackets as well as all of the other needed equipment. On my first time there, we were able to get the paddles adjusted to my liking, and in just a short amount of time, I was ready to go! Two volunteers lifted me from my wheelchair into the kayak. They provide you with as much assistance as you need. You even have a volunteer that is near you the entire time while you are on the water just in case you run into any problems. The first time I went out, I admit I was a little nervous on how stable the boat would be, but I was pleasantly surprised that it was very stable, and I let go of my fear about tipping over. It was a great feeling to be out of the wheelchair and free on the open water. It did not take very long to figure out how to paddle decently and before I knew it I was cruising right along. One thing I will say is it is good exercise. I found myself getting winded sooner than expected. After about an hour, I had pretty much worn myself out and was ready to come back to the dock. When you are finished, volunteers are there to assist you in getting back into your wheelchair if you require one. Since I have been participating in this fun activity, I have gotten to meet people there — some with visual disabilities, amputees, and varying levels of spinal cord injuries. There is a young man that is a higher level quadriplegic than myself. They have a special modification for him that actually holds the paddle on a bar that comes up between his legs so all he has to do is connect his hands to the paddle and rotate the paddle into the water. I can see the joy in his face every time he goes out because this has just opened up a new world for him. rehabilitation center, associations, support groups, or other resources specific to your condition. Some of the other activities available in my area include adaptive waterskiing and sailing. Then get out there and have some fun! Did you know September is Spinal Cord Injury Awareness Month? Learn more.